The two coins pictured below have been reported stolen/missing. The victim advises the coins were last seen at the Feb 28-March 3,2019 Baltimore Coin show. 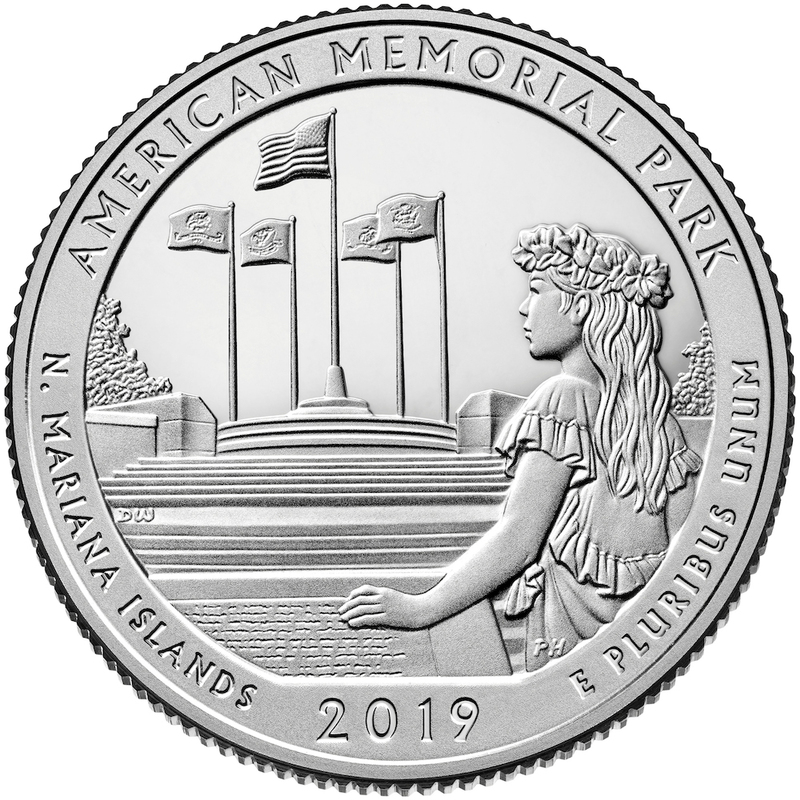 The United States Mint will officially launch the America the Beautiful Quarters® Program coin honoring American Memorial Park in the Commonwealth of the Northern Mariana Islands (CNMI) on Tuesday, April 30, at 10 a.m. Chamorro Standard Time (ChST). The free event will include an exchange of $10 rolls of newly minted American Memorial Park quarters after the ceremony. The United States Mint will host a coin forum the evening before the launch ceremony—Monday, April 29, 2019, 5-6 p.m. ChST—at the American Memorial Park Visitor Center Theatre on Micro Beach Road in Garapan, Saipan, CNMI. The coin forum is an opportunity for the public to learn about upcoming United States Mint coin programs and initiatives, and express their views about future coinage. The American Memorial Park quarter is the 47th release in the United States Mint America the Beautiful Quarters Program, a 12-year initiative that honors 56 national parks and other national sites authorized by Public Law 110-456. Each year until 2020, the public will see five new national sites depicted on the reverses (tails sides) of the America the Beautiful Quarters. A final coin will be released in 2021. The United States Mint is issuing these quarters in the order in which the national sites were officially established. The coins were housed in either 1.5×1.5 cardboard or 2×2 flips. Labeled with year, mint, grade and price. On reverse would have a cost code. The code would have a letter J in it for the decimal point. Printed in black ink and capital letters. Small cents, nickels and dimes in 1.5×1.5 flips and quarters thru dollars in 2×2’s. During the show’s opening ceremonies on Thursday morning, President Adkins presented National Money Show Host Chair Pat McBride with the ANA Goodfellow Award in recognition of his service. 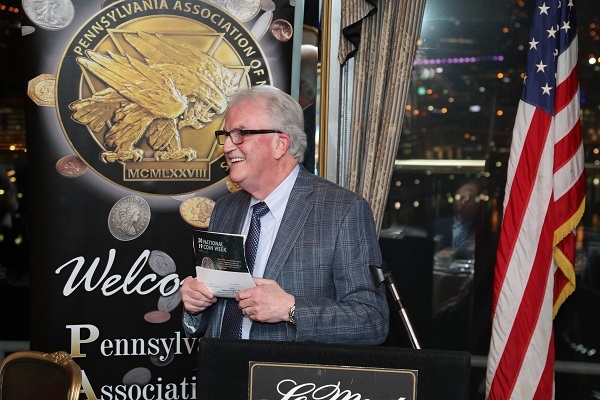 Adkins also recognized the host club, the Pennsylvania Association of Numismatists and its president, Tom Uram, with the Lewis S. Werner Host Club Award. The event featured 180 companies buying and selling coins, currency and related items; a wide range of numismatic educational presentations led by notable speakers; a three-session sale by Kagin’s Auctions; and exhibits of priceless rarities from private collections and the American Numismatic Association’s Money Museum in Colorado Springs. ANA President Gary Adkins addresses attendees during the PAN-hosted dinner to kick off the National Money Show. The week kicked off on Wednesday, March 27 with a dinner hosted by PAN at the Five-Star Diamond Award-Winning LeMont Restaurant, known for its spectacular view of Pittsburgh from atop Mt. Washington. United States Mint Director David Ryder gave the keynote presentation on his efforts to revitalize the Mint, including an increase in marketing coin collecting. A major draw for numismatists and the general public alike were the collector exhibits and the Museum Showcase. On display were a 1913 Liberty Head nickel, one of a mere five struck, and a Class III 1804 silver dollar, one of eight known. Also featured was a1943 Lincoln cent erroneously struck on a bronze planchet, and a world-class case filled with historic Pennsylvania paper money. A 1933 Indian Head eagle (gold $10) on display was a bona fide showstopper. The Kids Zone offered youngsters a plethora of activities to engage them in coin collecting, including a Treasure Trivia game where they learned about numismatics and earned prizes as they explored the bourse floor in search of answers to trivia questions. A Young Collectors Corner also debuted this year, offering basic information about the hobby. Former United States Mint Chief Engraver Don Everhart was the guest of honor at the ANA Legacy Series on Thursday afternoon, March 28. During the interview, moderated by Barbara Gregory, editor-in-chief of The Numismatist, attendees learned about his early years, professional challenges, and crowning achievements in the world of numismatic art and design. Everhart elaborated on his decades-long career during his “Money Talks” presentation, “Don Everhart: A Career in Coin Design,” on Friday, March 29. Nearly a dozen free Money Talks presentations were offered at the event, highlighting historically significant events, artistic vision and numismatic objects from around the globe. The $10 Treasury note from the War of 1812, part of the Joel Anderson Collection of Treasury Notes. The note realized $336,000 during Kagin’s auction at the National Money Show. Photo Courtesy of Kagin’s Auctions. $336,000 for a unique $10 Treasury note from the War of 1812 (Friedberg TN-14b) part of the Joel Anderson Collection of Treasury Notes. The 16 lots realized a total of $561,720. $180,000 for an 1860 Clark, Gruber & Co. Pikes Peak $20 gold coin with a reeded edge, Rarity 6+, certified Professional Coin Grading Service (PCGS) “Graffiti [About Uncirculated] Detail.” One of nine known. $38,400 for a 1796 “Reverse of 1794” large cent, graded PCGS Mint-State-62 Brown. $28,800 for an 1888 $3 gold coin, graded PCGS Proof-65 Cameo. According to ANA Executive Director Kim Kiick, attendance at the Pittsburgh National Money Show was relatively slow on Thursday and Friday, but more than a thousand people registered on Saturday. “Pittsburgh is a working town and as such, most people couldn’t get to the show until Saturday,” she said. The next ANA convention is the 2019 World’s Fair of Money® to be held August 13-17 in Chicago (Rosemont), Illinois, at the Donald E. Stephens Convention Center. The 2020 National Money Show is slated for February 27-29 at the Cobb Galleria Centre in Atlanta, Georgia. The ANA Board of Governors will be selecting the 2021 National Money Show site in May. The ANA Board of Governors met in open session on Saturday, March 30 to review and approve the IRS Form 990 and Fiscal Year 2018 audited financial statement prepared by Waugh & Goodwin, LLP, and to receive an update on ANA financials from Treasurer Larry Baber. Fiscal Year 2018 expenses were $5,806,161, of which $4,710,294 were directly related to ANA programs (conventions, magazine, education, museum, library) and $1,095,867 were for support services (marketing, fundraising, membership, development, administration). The ANA’s Fiscal Year 2018 audited financial statement and IRS Form 990 are available for review online at money.org/financial-reports.